So… Confession: It’s not often that one Monsieur develops a man crush on another. Then you get a prime specimen smartly suited, effortlessly snarky, spectacularly sculpted in the form of Ryan Gosling in his latest film- Crazy.Stupid.Love. Yes, the movie is a departure from brooding independent flick Drive (check out his beautiful Patek Philippe)but steering from noir into the realm of Hollywood dramedy, there can be little doubt that Gosling and his crazy awesome suits (did you see Fracture?) are on the way into the stratosphere. 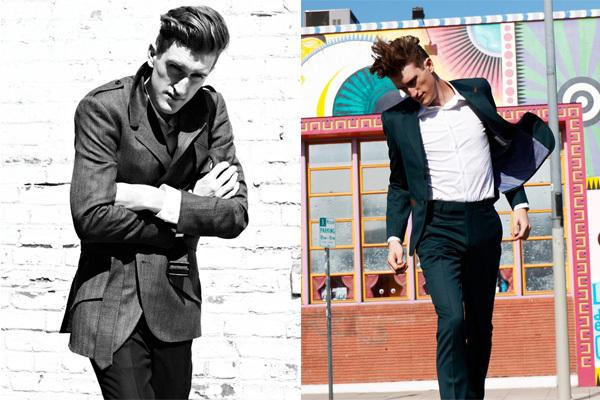 In the movie, Ryan Gosling’s suits are actually designed by The Stroke’s Albert Hammond Jr. Impeccably cut, the musician partnered with Ilaria Urbinati of LA boutique Confederacy producing what I’ve found to be one of the more exquisitely detailed (leather tipped lapels and pocket sleeves) suits for menswear 2011. Pricey (USD2125 and up) as befitting bespoke creations, each hand tailored outfit embody the spirit of classic elegance that would ensure many years of fine fitting luxury for its owner. The blue suit worn by Ryan Gosling is also available in Brown Houndstooth by Albert Hammond Jr.
That said, while I was a little surprised that the Costume Designer for Crazy.Stupid.Love. would pick tailored artistry from a rocker for The Stroke but on hindsight, a role like the womanizing Jacob Palmer would require a rocker aesthetic. This Stroke is a rocking sartorial wonder himself. Ryan wore the burgundy suit featured on the extreme right in the movie. 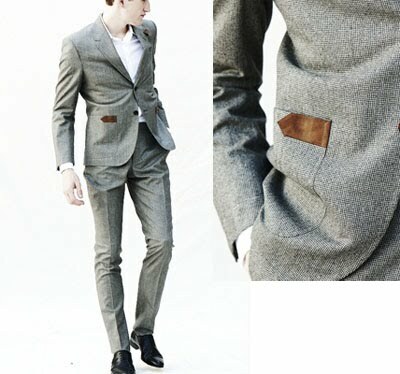 Details like buttons, different materials on lapels and pocket flaps can be customized. When buying off the rack, always buy one size smaller than you think you are. Get an off the rack suit altered to fit first chance you get. Is Ryan Gosling the man with Everything? He got the girl, he has the abs but I guess we can all take some comfort that he didn’t get to keep his suits, “They didn’t give me those suits. I wanted those suits. They’re sitting in a warehouse somewhere, I don’t know who that serves. They’re there, fitted for me, not being worn by me. Now that I’m an actor and I have movies, press, I have more occasions to wear suits. I like wearing suits.” He might not have everything but he’s definitely still- man crush worthy. Monsieur’s Brief: Gosling’s shirts are from Alexander McQueen, Simon Spurr and Yves Saint Laurent. The rings if you must know are David Yurman but my advice is- the only jewelry worn by a gentleman should be his watch, his wedding ring and one religious symbol. But then again, Jacob was a player; an entirely different beast. ← Inequality: Which are Socially Acceptable and Which are Not? one of the rings isn’t Yurman – silver with black stone in very good oval shape. Do you know what is it? Regarding Gosling’s quote about the suits sitting in a wardrobe. 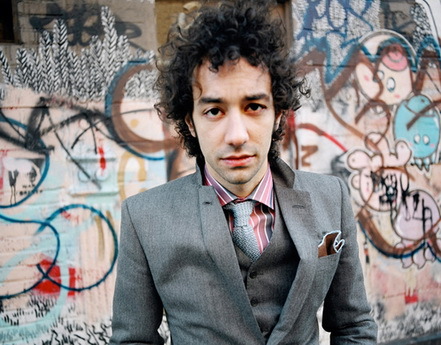 The Albert Hammond Jr. suit is actually in a costume museum at Warner Brothers Studios in Hollywood. I just saw it on the VIP tour a few weekends ago. Fun Fact about the shirt Gosling wears with the suit: the colour of the stripes perfectly match the colour of the suit. I just love Gosling’s suits in Crazy Stupid Love particularly his maroon suit, in my humble opinion it is one of the best suits putt on by him. Gosling is my style icon !